When I started thinking about artwork, I first reflected on colors and textures that seem to appear a lot in our home and leather was one of the first things that came to mind. I would probably make everything I own leather if I could, even my pajamas, but that would be ridiculous, right? (Note to self: google leather pajama options later). It doesn’t even have to be real leather either, I’m pretty well stocked on the faux variety as well and love it just as much. So, I decided to take that love of leather and bring it to my walls as well. It took a bit of trial and error for me to figure out the best route, but it turned out to be one of my favorite projects I’ve done so far. 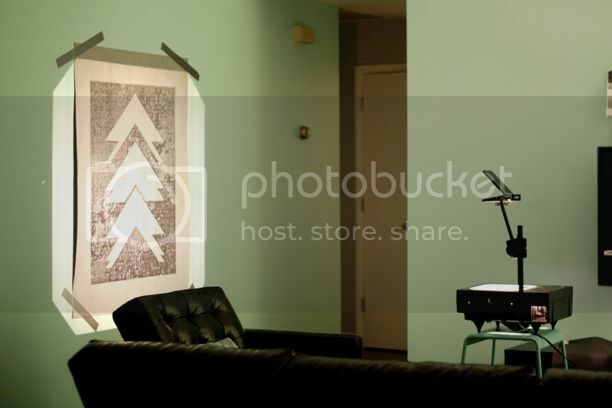 First I printed my pattern onto a clear transparent projector sheet and projected the image onto the wall. If you don’t have a projector, you can just draw your pattern by hand or trace a stencil, but I love my projector and I highly recommend getting one if you don’t own one already. I taped my sheet of faux leather (faux leather is much less expensive and animal friendly- double win!) wrong side facing out so I could trace my design on top. Once it was traced, I was able to cut out the parts where I wanted the canvas to show through with an X-Acto knife. Once the leather is cut, prepare your canvas by painting your shapes or design that will be seen under the leather. You can lay your leather piece over top of your blank canvas first and trace the shape so you can see what areas should be totally filled with your design. I must say that I was a little overzealous with the amount of shapes that I was trying to line up exactly, so I would suggest doing something a little simpler if you don’t want to take the time to line each one up perfectly. 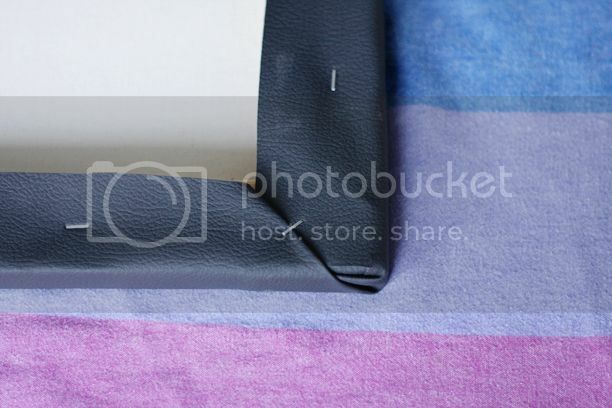 Once your design is painted, place your leather over top and line the two up so that they meet in the right spots. Next, use a fabric glue to attach your leather to your canvas and add some weights (like paint bottles as I did) to any edges that you don’t want to curl while the glue dries. 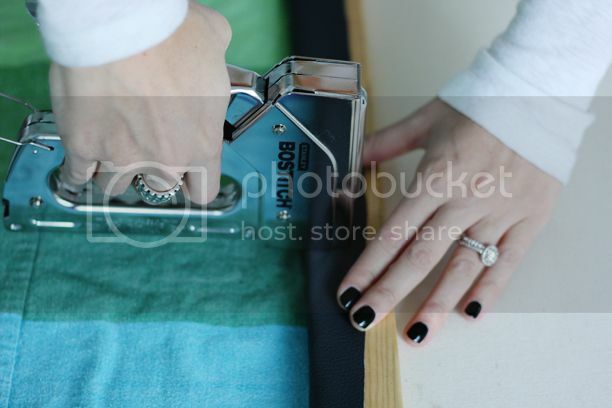 Next, wrap the leather edges around the sides and staple them in place with a staple gun. 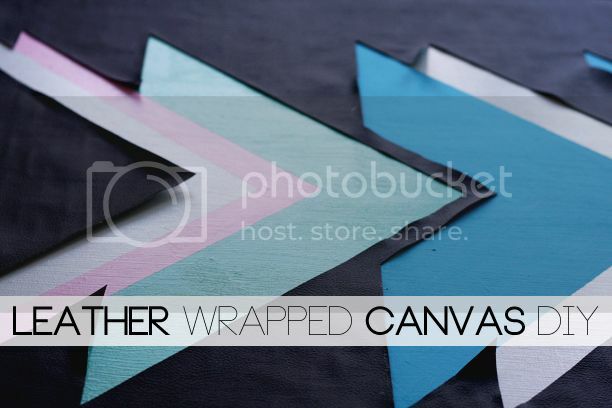 This will give your canvas wrapped edges on the sides so you won’t have to frame your piece if you don’t want to- it will already look finished without a frame! By the way, if you are wondering what to do with the corners, I wrapped mine the same way you would wrap a present and stapled it in place. 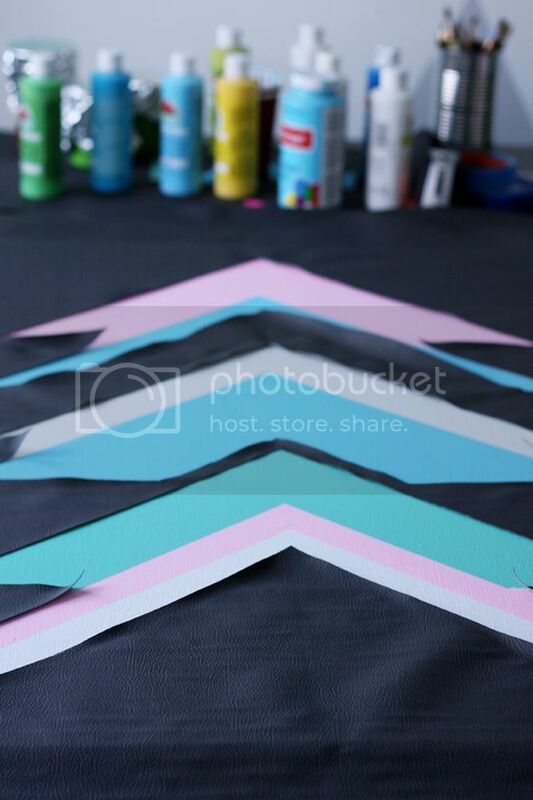 This is definitely a project that you’ll have to devote a bit of time to if you are doing a complicated version, but you could make it relatively quick if you were doing a smaller canvas or a simpler design. Either way, it was well worth the effort as far as I’m concerned. I love the look of the finished project! 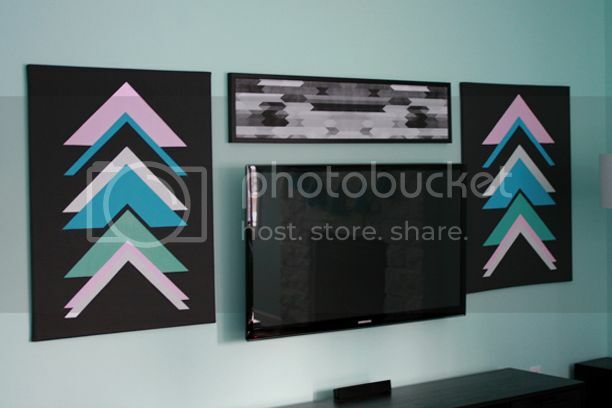 The pieces look so textured on the wall, and I can’t wait to use leather in more art projects around the house. Hope you get a chance to try this too! Categories: HCYMT? 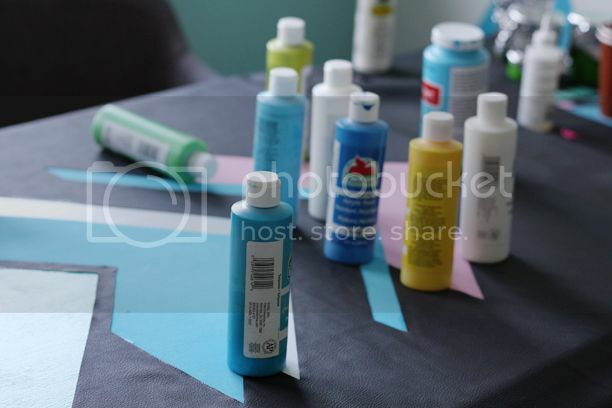 | Tags: diy, leather canvas | April 12, 2013 by thebandwife. This project is amazing! It turned out so well. Thanks for sharing! These turned out so great! I wish everything I owned was leather as well..
Where did you get your entertainment shelves/unit? Good question! I think it was either Target or Wal-Mart weirdly enough! Hahaha. Awesome. I’m a huge fan of Target. I’m in the market for one because my current one just isn’t big enough anymore. I’ve been scouring IKEA and Target looking for the right one. Thanks! P.S. The leather looks so great! Good job. This looks AMAZING!! The end result is so clean! 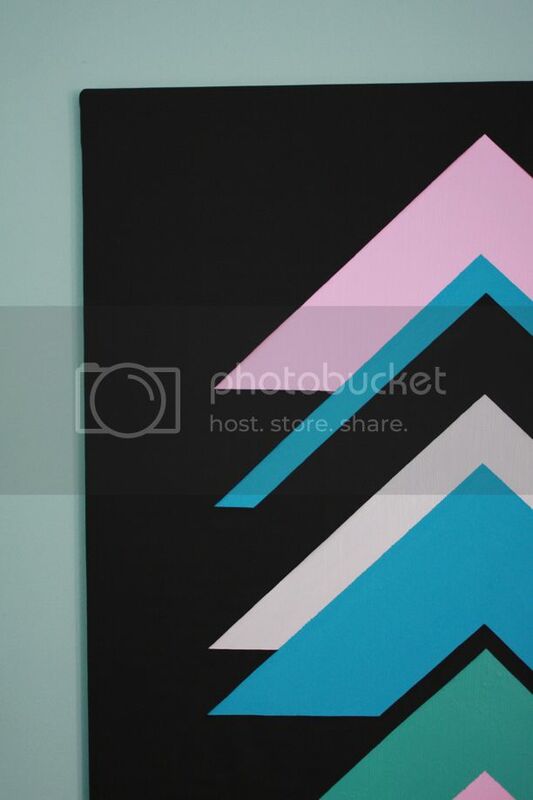 I’m about to redo my gallery wall and I’ll definitely be trying this. Thanks for the inspiration! You are amazing! This is one of my favorites from you so far!! This is such a neat idea, and it’s super cool looking. We used an electrician to hide our wires in the wall, totally worth it! !